The Taíno are pre-Columbian indigenous inhabitants of the Bahamas, Greater Antilles, and some of the Lesser Antilles. Their name Taino comes from their encounter with Christopher Columbus. Other Europeans arriving in South America called the same culture of people Arawak from the word for cassava flour, a staple of the race. Their language is a member of the Maipurean linguistic family, which ranges from South America across the Caribbean, and is thought to have been part of the larger, hypothetical group of Arawakan languages that would have spread over an even wider area. A peaceful people, the Taino had long been on the defensive against their aggressive neighbors, the Caribs, from whom the Caribbean Sea gets its name. Easily dominated by the Spaniards, the Taino population was rapidly decimated by European diseases and overwork by their Spanish overlords who treated them as slaves. While most of their culture was wiped out, Taino survived in Puerto Rico, albeit of mixed lineage, and efforts have been made to revive Taino identity and culture. The indigenous people Christopher Columbus encountered in his first voyage called themselves Taíno, meaning "good" or "noble," to differentiate themselves from Island-Caribs. Columbus thus called these people the Taino. The name was applied to all the Island Taíno who in the Lesser Antilles were often labeled according to their specific tribe. Locally, the Taíno referred to themselves by the name of their location. Other Europeans arriving in South America called the same culture of people "Arawak" from their word for cassava flour, a staple of the race. From this, the language and the people were eventually called Arawak. It was later realized that the culture and language and indeed the race of peoples known as Arawak and those known as Taíno were one and the same. Differentiation was made between the Mainland Taíno or Mainland Arawak living in Guyana and Venezuela, the Island Taíno or Island Arawak living in the Windward Islands and simply, the Taíno, living in the Greater Antilles and the Leeward Islands. Going through time, different writers, travelers, historians, linguists, and anthropologists, have interchangeably used these terms. Taíno has been used to mean the Greater Antillean tribes only, those plus the Bahamas tribes, those and the Leeward Islands tribes, or all those excluding the Puerto Rican tribes and Leeward tribes. Island Taíno has been used to refer to those living in the Windward Islands only, those in the northern Caribbean only, or those living in any of the islands. Modern historians, linguists, and anthropologists now hold that the term Taíno should refer to all the Taíno/Arawak tribes except for the Caribs. The Caribs are not seen by anthropologists nor historians as being the same people although linguists are still debating whether the Carib language is an Arawakan dialect or creole language—or perhaps a distinct language, with an Arawakan pidgin often used in communication. Rouse has classified all inhabitants of the Greater Antilles (except the western tip of Cuba), the Bahamian archipelago, and the northern Lesser Antilles as Taíno. The Taíno are subdivided into three main groups: Classic Taíno, from Hispaniola and Puerto Rico, Western Taíno or sub-Taíno, from Jamaica, Cuba (except for the western tip) and the Bahamian archipelago, and Eastern Taíno, from the Virgin Islands to Montserrat. 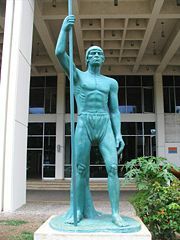 The Taíno of the Bahamas were known as the Lucayan (the Bahamas being known then as the Lucayas), while those in Puerto Rico called themselves Boriquen. Two schools of thought have emerged regarding the origin of the indigenous people of the West Indies. One group contends that the ancestors of the Taíno came from the center of the Amazon Basin, subsequently moving to the Orinoco valley. From there they reached the West Indies by way of Guyana and Venezuela into Trinidad, proceeding along the Lesser Antilles all the way to Cuba and the Bahamian archipelago. Evidence that supports this theory includes the tracing of the ancestral cultures of these people to the Orinoco Valley and their languages to the Amazon Basin. The alternate theory, known as the circum-Caribbean theory, contends that the ancestors of the Taíno diffused from the Colombian Andes. Julian Steward, the theory's originator, suggested a radiation from the Andes to the West Indies and a parallel radiation into Central America and into the Guyanas, Venezuela, and the Amazon Basin. At the time of Columbus' arrival in 1492, there were five Taíno kingdoms or territories on Hispaniola, each led by a principal Cacique (chieftain), to whom tribute was paid. At the time of the Spanish conquest, the largest Taíno population centers may have contained around 3,000 people or more. The Taíno were historical neighbors and enemies of the Carib, another group with origins in South America who lived principally in the Lesser Antilles. The relationship between the two groups has been the subject of much study. By the eighteenth century, Taíno society had been decimated by introduced diseases such as smallpox, and forced assimilation into the plantation economy that Spain imposed in its Caribbean colonies, with its subsequent importation of African slave workers. It is argued that there was substantial mestizaje as well as several Indian pueblos that survived into the nineteenth century in Cuba. The Spaniards who first arrived in the Bahamas, Cuba, and Hispaniola in 1492, and later in Puerto Rico, did not bring women. They might have taken Taíno wives in civil marriages or otherwise impregnated Taíno women, which would have resulted in mestizo children. Columbus and his crew, landing in the Bahamas on October 12, 1492 were the first Europeans to encounter the Taíno people. A group of Taino people accompanied Columbus on his return voyage back to Europe. The Taínos lived on an island which they called Guanahani. After arriving on the island, Columbus renamed it as "San Salvador" (Spanish for "Holy Savior"). It was Columbus who called the Taíno "Indians," an identification that has grown to encompass all the indigenous peoples of the Western Hemisphere. At this time the neighbors of the Taíno were the Guanahatabeys in the western tip of Cuba, and the Island-Caribs in the Lesser Antilles from Guadaloupe to Grenada. Early population estimates of Hispaniola, probably the most populous island inhabited by Taínos, range from 100,000 to 1,000,000 people. The maximum estimates for Jamaica and Puerto Rico, the most densely populated islands after Hispaniola, are 600,000 people. The population had shrunk to 60,000 and by 1531 to 3,000 in Hispanola. In thirty years, between 80 percent and 90 percent of the population died. Many of them were worked to death in the mines and fields, put to death in harsh put-downs of revolts or committed suicide (throwing themselves out of the cliffs or consuming manioc) to escape their cruel new masters. The Taíno were not immune to European diseases, notably smallpox. Scholars now believe that, among the various contributing factors, epidemic disease was the overwhelming cause of the population decline of the American natives. On Columbus' second voyage, he began to require tribute from the Taíno in Hispanola. Each adult over 14 years of age was expected to deliver a certain quantity of gold. In the earlier days of the conquest, if this tribute was not observed, the Taíno were either mutilated or executed. Later on, fearing a loss of labor forces, they were ordered to bring 25 lb (11 kg) of cotton. This also gave way to a service requirement called encomienda. Under this system, Taíno were required to work for a Spanish land owner for most of the year, which left little time to tend to their own community affairs. Statue of Enriquillo at the Museo De Hombre Dominicano, Santo Domingo, Dominican Republic. In 1511, several caciques in Puerto Rico, such as Agueybana, Uroyoan, Guarionex, and Orocobix, allied with the Caribs and tried to oust the Spaniards. The revolt was pacified by the forces of Governor Juan Ponce de León. Hatuey, a Taíno chieftain who had fled Hispañola to Cuba with 400 natives in order to unite the Cuban natives, was burned at the stake on February 2, 1512. In Hispañola, a Taíno chieftain named Enriquillo mobilized over 3,000 remaining Taíno in a successful rebellion in the 1530s. These Taíno were accorded land and a charter from the royal administration. It had little consequence however, as by this time the Indian population was rapidly declining due to European diseases. 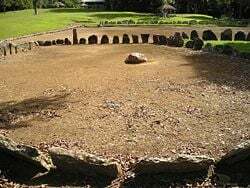 In the center of a typical Taíno village (yucayeque) was a plaza used for various social activities such as games, festivals, religious rituals, and public ceremonies. These plazas had many shapes—oval, rectangular, or narrow and elongated. Ceremonies where the deeds of the ancestors were celebrated, called areitos, were performed there. The general population lived in large circular buildings (bohio), constructed with wooden poles, woven straw, and palm leaves. These houses would surround the central plaza and could hold 10-15 families. The cacique and his family would live in rectangular buildings (caney) of similar construction, with wooden porches. Taíno home furnishings included cotton hammocks (hamaca), mats made of palms, wooden chairs (dujo) with woven seats, platforms, and cradles for children. Caguana Ceremonial ball court (batey), outlined with monoliths. The Taíno played a ceremonial ball game called batey. The game was played between opposing teams consisting of 10 to 30 players per team using a solid rubber ball. Normally, the teams were composed of only men, but occasionally women played the game as well. The Classic Taínos played in the village's center plaza or on especially designed rectangular ball courts also called batey. Batey is believed to have been used for conflict resolution between communities; the most elaborate ball courts are found in chiefdoms' boundaries. Often, chiefs made wagers on the possible outcome of a game. Taíno society was divided into two classes: naborias (commoners) and nitaínos (nobles). These were governed by chiefs known as caciques (who were either male or female) which were advised by priests/healers known as bohiques.'. Bohiques were extolled for their healing powers and ability to speak with gods and as a result, they granted Tainos permission to engage in important tasks. Taínos lived in a matrilineal society. When a male heir was not present the inheritance or succession would go to the eldest child (son or daughter) of the deceased’s sister. Taínos practiced a mainly agrarian lifestyle but also fished and hunted. A frequently worn hair style featured bangs in front and longer hair in back. They sometimes wore gold jewelry, paint, and/or shells. Taíno men sometimes wore short skirts. Taíno women wore a similar garment (nagua) after marriage. Some Taíno practiced polygamy. Men, and sometimes women, might have two or three spouses, and the caciques would marry as many as 30. Taínos spoke a Maipurean language. Some of the words used by them such as barbacoa (barbecue), hamaca (hammock), canoa (canoe), tabaco (tobacco), yuca (yucca), and Huracan (hurricane) have been incorporated into the Spanish and English languages. The Taíno diet centered around vegetables and fruits, meat, and fish. Large animals were absent from the fauna of the West Indies, but small animals such as hutias, earthworms, lizards, turtles, birds, and other mammals were consumed. Manatees were speared and fish were caught in nets, speared, poisoned, trapped in weirs, or caught with hook and line. Wild parrots were decoyed with domesticated birds and iguanas were extracted from trees and other vegetation. Taínos stored live animals until they were ready to be consumed—fish and turtles were stored in weirs, and hutias and dogs were stored in corrals. Taíno groups in the more developed islands, such as Hispaniola, Puerto Rico, and Jamaica, relied more on agriculture. For important crops they used a sophisticated procedure in which they "heaped up mounds of soil," called conucos, which improved drainage, delayed erosion, and allowed for a longer storage of crops in the ground; for less important crops such as corn they used the more common and rudimentary slash and burn technique. Conucos were 3 feet high and 9 feet in circumference and were arranged in rows. The primary root crop was cassava, a woody shrub cultivated for its edible starchy tuberous root. It was planted using a coa, an early kind of hoe made completely out of wood. Women squeezed cassava to extract its poisonous juice and ground the roots into flour from which they baked bread. Batata (Sweet potato) was the Taíno's secondary crop; it was consumed as a vegetable. Contrary to mainland practices, corn was not ground into flour and baked into bread. Instead, it was eaten off the cob. A possible explanation for this is that corn bread becomes moldy faster than cassava bread in the high humidity of the West Indies. Taínos grew squash, beans, peppers, peanuts, and pineapples. Tobacco, calabashes (West Indian pumpkins), and cotton were grown around the houses. Other fruits and vegetables, such as palm nuts, guavas, and Zamia roots, were collected from the wild. Taínos used cotton, hemp, and palm extensively for fishing nets and ropes. Their dugout canoes (Kanoa) were made in various sizes, which could hold from 2 to 150 people. An average sized kanoa would hold about 15 - 20 persons. They used bows and arrows, and sometimes put various poisons on their arrowheads. For warfare, they employed the use of a wooden war club, which they called a macana, that was about one inch thick and was similar to the cocomacaque. Taíno religion centered on the worship of zemís or cemís. Cemís were either gods, spirits, or ancestors. There were two supreme gods: Yúcahu, which means spirit of cassava, was the god of cassava (the Taínos main crop) and the sea and Atabey, mother of Yúcahu, was the goddess of fresh waters and fertility. Other minor gods existed in Taíno religion; some of them related to the growing of cassava while others were related to the process of life, creation and death. Baibrama was a god worshiped for his assistance in growing cassava and curing people from its poisonous juice. Boinayel and his twin brother Márohu were the gods of rain and fair weather respectively. Popular belief names Juracán as the god of storms but juracán was only the word for hurricane in the Taíno language. Guabancex was the goddess of storms (hurricanes). Guabancex had two assistants: Guataubá, a messenger who created hurricane winds, and Coatrisquie, who created floodwaters. Maquetaurie Guayaba or Maketaori Guayaba was god of Coaybay, the land of the dead. Opiyelguabirán, a dog-shaped god, watched over the dead. Deminán Caracaracol, a male cultural hero from which the Taíno believed to descend, was worshiped as a cemí. 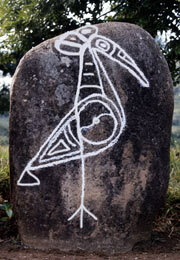 Rock petroglyph overlayed with chalk in the Caguana Indigenous Ceremonial Center in Utuado, Puerto Rico. Cemí was also the name of the physical representations of the gods. These representations came in many forms and materials and could be found in a variety of settings. The majority of cemís were crafted from wood but stone, bone, shell, pottery, and cotton were also used. Cemí petroglyphs were carved on rocks in streams, ball courts, and on stalagmites in caves. Cemí pictographs were found on secular objects such as pottery, and on tattoos. Yucahú, the god of cassava, was represented with a three-pointed cemí which could be found in conucos to increase the yield of cassava. Wood and stone cemís have been found in caves in Hispaniola and Jamaica. Cemís are sometimes represented by toads, turtles, snakes, and various abstract and human-like faces. Some of the carved Cemís include a small table or tray which is believed to be a receptacle for hallucinogenic snuff called cohoba prepared from the beans of a species of Piptadenia tree. These trays have been found with ornately carved snuff tubes. Before certain ceremonies, Taínos would purify either by inducing vomiting with a swallowing stick or by fasting. After the serving of communal bread, first to the Cemi, then to the cacique, and then to the common people; the village epic would be sung and accompanied by maraca and other instruments. Taíno oral tradition explains that the sun and moon come out of caves. Another story tells that people once lived in caves and only came out at night, because it was believed that the Sun would transform them. The Taíno believed they were descended from the union of Deminaán Caracaracol and a female turtle. The origin of the oceans is described in the story of a huge flood which occurred when a father murdered his son (who was about to murder the father), and then put his bones into a gourd or calabash. These bones then turned to fish and the gourd broke and all the water of the world came pouring out. Taínos believed that the souls of the dead go to Coaybay, the underworld, and there they rest by day, and when night comes they assume the form of bats and eat the fruit "guayaba." Many people still claim to be descendants of the Taíno, most notably Puerto Ricans, both on the island and on the United States mainland. People claiming to be Taíno descendants have been active in trying to assert a call for recognition of their tribe. A recent study conducted in Puerto Rico suggests that over 61 percent of the population possess Taíno mitochondrial DNA. Recently, a few Taíno organizations, such as the Jatibonicù Taíno Tribal Nation of Boriken (Puerto Rico) (1970), the Taino Nation of the Antilles (1993) and the United Confederation of Taino People (an international initiative) (1998), have been established to put forth these claims. What some refer to as the "Taíno revival movement" can be seen as an integral part of the wider resurgence in Caribbean indigenous self-identification and organization. The Jatibonicu Taíno tribe of Boriken, had reaffirmed and reorganized itself in Puerto Rico on November 18, 1970. Lambda Sigma Upsilon, a Latino Fraternity, adapted the Taíno Indian as their cultural identity symbol in 1979. ↑ 2.0 2.1 Rouse, 7. ↑ 4.0 4.1 Rouse, 30-48. ↑ Encarta onlineSmallpox Through History Retrieved September 18, 2007. ↑ Kay M. Porterfield,American Indian Epidemics Retrieved September 18, 2007. ↑ David W. Tschanz The War Against SmallpoxStrategyPage.com. Retrieved September 18, 2007. ↑ University of Illinois at Chicago, online classes in Oral Science: Infectious Diseases.European Disease in the New World Retrieved September 18, 2007. ↑ Jared Diamond. Guns, Germs and Steel The Story Of... Smallpox PBS online. Retrieved September 18, 2007. ↑ 13.0 13.1 Ricardo Alegría, "The Ball Game Played by the Aborigines of the Antilles." American Antiquity 16 (4) (April 1951): 348. ↑ Taino World Caciques, nobles and their regalia accessdate 2006-11-09 El Museo del barrio. elmuseo.org. ↑ 15.0 15.1 Rouse, 13. ↑ 16.0 16.1 16.2 Rouse, 12. ↑ The Taínos of Quisqueya (Dominican Republic) called him "Yucahú Bagua Maorocotí," which means "White Yuca, great and powerful as the sea and the mountains". ↑ Other names for this goddess include "Guabancex," "Atabei," "Atabeyra," "Atabex," and "Guimazoa". ↑ 19.0 19.1 Rouse, 119. ↑ Indigenous resurgence in the contemporary Caribbean Retrieved September 18, 2007. ↑ Government of the Jatibonicu Taino People Retrieved September 18, 2007. ↑ Lambda Sigma Upsilon accessed on October 30, 2006. DeRLAS. 2000. Some important research contributions of Genetics to the study of Population History and Anthropology in Puerto Rico. Newark, Delaware: Delaware Review of Latin American Studies. Retrieved September 18, 2007. Forte, Maximilian C. 2006. Indigenous Resurgence in the Contemporary Caribbean: Amerindian Survival and Revival]. New York: Peter Lang Publishing. ISBN 0820474886 Retrieved September 18, 2007. Guitar, Lynne. 2000. "Criollos: The Birth of a Dynamic New Indo - Afro - European People and Culture on Hispaniola" in KACIKE: The Journal of Caribbean Amerindian History and Anthropology 1(1): 1-17 Retrieved September 18, 2007. Martínez Cruzado, Juan C. 2002. "The Use of Mitochondrial DNA to Discover Pre-Columbian Migrations to the Caribbean:Results for Puerto Rico and Expectations for the Dominican Republic." KACIKE: The Journal of Caribbean Amerindian History and Anthropology [On-line Journal], Special Issue, Lynne Guitar, Ed. Torres, Constantino M. 1998. "The Role of Cohoba in Taino Shamanism" in Eleusis No. 1. Torres, Constantino M. 2001. "Shamanic Inebriants in South American Archaeology: Recent lnvestigations" in Eleusis No. 5. Taino Diccionary, A dictionary of words of the indigenous peoples of caribbean from the encyclopedia "Clásicos de Puerto Rico, second edition, publisher, Ediciones Latinoamericanas. S.A., 1972" compiled by Puerto Rican historian Dr. Cayetano Coll y Toste of the "Real Academia de la Historia." This page was last modified on 12 November 2015, at 15:28.